Common as an important ore of zinc, gem quality sphalerite is a rare collector stone. The mineral is usually nearly black in color but is occaisionally found in transparent pieces of an orange or yellowish brown hue. Clean pieces are extremely rare. 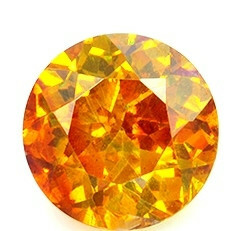 With a dispersion three times higher than diamond, gem sphalerite is one of the brightest and most dispersive of all minerals. It has a hardness of 3.5 - 4 as well as 6 directions of perfect cleavage. Spahlerite is very difficult to polish and is too soft to be used in jewelry.